Rino’s Kitchen, fresh off releasing a new permanent menu featuring items like Southwest Rice Balls and a Gnocchi with mushrooms in a curry sauce, is getting ready for the 2012 Winter Bites Culinary Week. Along with some great selections you have come to expect from Chef Rino Bortolin, he is adding a new twist. Earlier this year the Naturalized Habitat Network of Essex County & Windsor launched a new community initiative called “Project Pawpaw”. This is a special project that will take place over a 12 month period that is aiming to restore and reintroduce the Paw Paw Tree and fruit back into Windsor and Essex County and to establish it as community supported, environmentally sustainable food source for our region. WindsorEats is helping out with this project through introducing the fruit to restaurants and chefs in Windsor-Essex (we’ll be posting a more in-depth article about this soon). Rino’s Kitchen will be using the Paw Paw fruit in a “First Bite” given to anyone who orders off his Winter Bites dinner menu. It will also be available as a first course option on the lunch menu. It consists of a fried, Indian inspired rice ball(s)with Paw Paw and rhubarb chutney. If you’ve never tasted it before (we’ll forgive you as we had never even heard of it before this project), the Paw Paw looks similar to a papaya with a taste along the lines of a banana. I’m a fan of things that have a bit of kick so I’ll be rockin’ the Moroccan. Ya that’s right, I went there. It was a toss up between this and the Morel Mushroom Gnocchi, but I figured now that the cold has finally arrived, what better way to warm up than with stew? A bonus: the stew is served over baked polenta. A classic dessert. How can you go wrong? Both the lunch and dinner Winter Bites Culinary Week menus from Rino’s Kitchen can be viewed here. Rino’s lunch menu is $15 per person and the dinner is $25 per person. Reservations are strongly recommended. 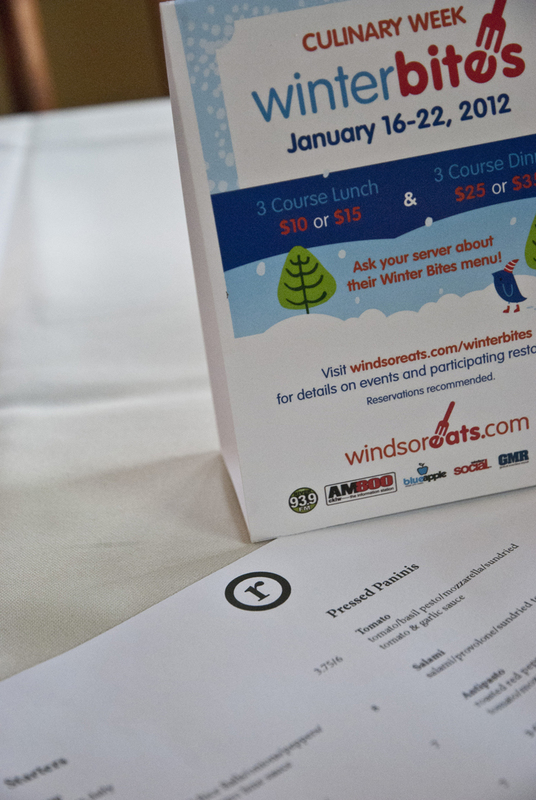 Winter Bites is Windsor and Essex County’s very own restaurant week. From January 16 to January 22, 2012, diners can visit any Winter Bites participating restaurant and indulge in a 3-course meal, created with 3 options in each course to choose from. Participating restaurants are open during their regular hours of operation.